American Chinese cuisine is a style of Chinese cuisine developed by Americans of Chinese descent. The dishes served in many North American Chinese restaurants are adapted to American tastes and often differ significantly from those found in China. Chinese immigrants arrived in the United States seeking employment as miners and railroad workers. As larger groups of Chinese immigrants arrived, laws were put in place preventing them from owning land. They mostly lived together in ghettos, individually referred to as "Chinatown". Here the immigrants started their own small businesses, including restaurants and laundry services. By the 19th century, the Chinese community in San Francisco operated sophisticated and sometimes luxurious restaurants patronized mainly by Chinese. The restaurants in smaller towns (mostly owned by Chinese immigrants) served food based on what their customers requested, anything ranging from pork chop sandwiches and apple pie, to beans and eggs. Many of these small-town restaurant owners were self-taught family cooks who improvised on different cooking methods and whatever ingredients were available. These smaller restaurants were responsible for developing American Chinese cuisine, where the food was modified to suit a more American palate. First catering to miners and railroad workers, they established new eateries in towns where Chinese food was completely unknown, adapting local ingredients and catering to their customers' tastes. Even though the new flavors and dishes meant they were not strictly Chinese cuisine, these Chinese restaurants have been cultural ambassadors to Americans. Chinese restaurants in the United States began during the California gold rush, which brought twenty to thirty thousand immigrants across from the Canton (Guangdong) region of China. By 1850, there were five Chinese restaurants in San Francisco. Soon after, significant amounts of food were being imported from China to America's west coast. The trend spread steadily eastward with the growth of the American railways, particularly to New York City. The Chinese Exclusion Act allowed merchants to enter the country, and in 1915, restaurant owners became eligible for merchant visas. This fueled the opening of Chinese restaurants as an immigration vehicle. As of 2015[update], the United States had 46,700 Chinese restaurants. Along the way, cooks adapted southern Chinese dishes such as chop suey and developed a style of Chinese food not found in China. Restaurants (along with Chinese laundries) provided an ethnic niche for small businesses at a time when the Chinese people were excluded from most jobs in the wage economy by ethnic discrimination or lack of language fluency. By the 1920s, this cuisine, particularly chop suey, became popular among middle-class Americans. However, after World War II it began to be dismissed for not being "authentic". Late 20th century tastes have been more accommodating. Take-out food became popular amongst Americans, Chinese food becoming a favorite option. By this time it became evident that Chinese restaurants no longer catered mainly for Chinese customers. There has been a consequential component of Chinese emigration of illegal origin, most notably Fuzhou people from Fujian Province and Wenzhounese from Zhejiang Province in Mainland China, specifically destined to work in Chinese restaurants in New York City, beginning in the 1980s. Adapting Chinese cooking techniques to local produce and tastes has led to the development of American Chinese cuisine. Many of the Chinese restaurant menus in the U.S. are printed in Chinatown, Manhattan, which has a strong Chinese American demographic. In 2011, the Smithsonian National Museum of American History displayed some of the historical background and cultural artefacts of American Chinese cuisine in its exhibit entitled, Sweet & Sour: A Look at the History of Chinese Food in the United States. American Chinese food builds from styles and food habits brought from the southern province of Guangdong, often from the Toisan district of Toisan, the origin of most Chinese immigration before the closure of immigration from China in 1924. These Chinese families developed new styles and used readily available ingredients, especially in California. The type of Chinese American cooking served in restaurants was different from the foods eaten in Chinese American homes. Of the various regional cuisines in China, Cantonese cuisine has been the most influential in the development of American Chinese food, especially that of Toisan, the origin of most early immigrants. Among the common differences is to treat vegetables as a side dish or garnish, while traditional cuisines of China emphasize vegetables. This can be seen in the use of carrots and tomatoes. Cuisine in China makes frequent use of Asian leaf vegetables like bok choy and kai-lan and puts a greater emphasis on fresh meat and seafood. Stir frying, pan frying, and deep frying tend to be the most common Chinese cooking techniques used in American Chinese cuisine, which are all easily done using a wok (a Chinese frying pan with bowl-like features and which accommodates very high temperatures). The food also has a reputation for high levels of MSG to enhance the flavor. Market forces and customer demand have encouraged many restaurants to offer "MSG Free" or "No MSG" menus, or to omit this ingredient on request. Carryout Chinese food is commonly served in a paper carton with a wire bale, known as an oyster pail. American Chinese cuisine makes use of ingredients not native to and very rarely used in China. One such example is the common use of Western broccoli (Chinese: 西蘭; pinyin: xīlán) instead of Chinese broccoli (Gai-lan, 芥蘭; jièlán) in American Chinese cuisine. Occasionally, Western broccoli is also referred to as sai1 laan4 fa1 in Cantonese (西蘭花) in order not to confuse the two styles of broccoli. Among Chinese speakers, however, it is typically understood that one is referring to the leafy vegetable unless otherwise specified. This is also the case with the words for carrot (luo buo or lo baak, or hong luo buo, hong meaning "red") and onion (yang cong). Lo baak, in Cantonese, refers to a large, pungent white radish. The orange Western carrot is known in some areas of China as "foreign radish" (or more properly hung lo baak in Cantonese, hung meaning "red"). When the word for onion, cong, is used, it is understood that one is referring to "green onions" (otherwise known to English-speakers as "scallions" or "spring onions"). The larger, many-layered onion bulb common in the United States is called yang cong. This translates as "foreign onion". These names make it evident that the American broccoli, carrot, and onion are not indigenous to China, and therefore are less common in the traditional cuisines of China. Egg fried rice in American Chinese cuisine is also prepared differently, with more soy sauce added for more flavor whereas the traditional egg fried rice uses less soy sauce. Some food styles, such as dim sum, were also modified to fit American palates, such as added batter for fried dishes and extra soy sauce. Salads containing raw or uncooked ingredients are rare in traditional Chinese cuisine, as are Japanese style sushi or sashimi. However, an increasing number of American Chinese restaurants, including some upscale establishments, have started to offer these items in response to customer demand. Ming Tsai, the owner of the Blue Ginger restaurant in Wellesley, Massachusetts, and host of PBS culinary show Simply Ming, said that American Chinese restaurants typically try to have food representing 3-5 regions of China at one time, have chop suey, or have "fried vegetables and some protein in a thick sauce", "eight different sweet and sour dishes", or "a whole page of 20 different chow meins or fried rice dishes". Tsai said "Chinese-American cuisine is 'dumbed-down' Chinese food. It’s adapted... to be blander, thicker and sweeter for the American public". Most American Chinese establishments cater to non-Chinese customers with menus written in English or containing pictures. If separate Chinese-language menus are available, they typically feature items such as liver, chicken feet, or other meat dishes that might deter American customers. In Chinatown, Manhattan, the restaurants were known for having a "phantom" menu with food preferred by ethnic Chinese, but believed to be disliked by non-Chinese Americans. Almond chicken - chicken breaded in batter containing ground almonds, fried and served with almonds and onions. General Tso's chicken – chunks of chicken that are dipped in a batter, deep-fried, and seasoned with ginger, garlic, sesame oil, scallions, and hot chili peppers. Believed to be named after Qing Dynasty statesman and military leader Zuo Zongtang, often referred to as General Tso. Sesame chicken – boned, battered, and deep-fried chicken which is then dressed with a translucent red or orange, sweet and mildly spicy sauce, made from soy sauce, corn starch, vinegar, chicken broth, and sugar. Chinese chicken salad – usually contains sliced or shredded chicken, uncooked leafy greens, crispy noodles (or fried wonton skins) and sesame dressing. Some restaurants serve the salad with mandarin oranges. Chop suey – connotes "assorted pieces" in Chinese. It is usually a mix of vegetables and meat in a brown sauce but can also be served in a white sauce. Crab rangoon – fried wonton skins stuffed with (usually) artificial crab meat (surimi) and cream cheese. 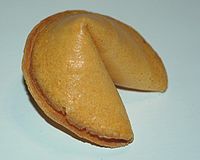 Fortune cookie – invented in California as a Westernized version of the Japanese omikuji senbei, fortune cookies have become sweetened and found their way to many American Chinese restaurants. Royal beef – deep-fried sliced beef, doused in a wine sauce and often served with steamed broccoli. 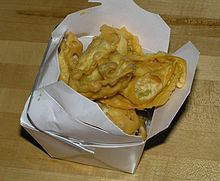 Fried wontons – somewhat similar to crab rangoon, a filling, (most often pork), is wrapped in a wonton skin and deep fried. Beef & Broccoli - flank steak cut into small pieces, stir-fried with broccoli, and covered in a dark sauce made with soy sauce and oyster sauce and thickened with cornstarch. Sweet roll - yeast rolls, typically fried, covered in granulated sugar or powdered sugar. Some variants are stuffed with cream cheese or icing. Sushi - despite being part of traditional Japanese cuisine, some American Chinese restaurants serve various types of sushi, usually on buffets. Authentic restaurants with Chinese-language menus may offer "yellow-hair chicken" (Chinese: 黃毛雞; pinyin: huángmáo jī; Jyutping: wong4 mou4 gai1; literally: 'yellow-feather chicken'), essentially a free-range chicken, as opposed to typical American mass-farmed chicken. Yellow-hair chicken is valued for its flavor, but needs to be cooked properly to be tender due to its lower fat and higher muscle content. This dish usually does not appear on the English-language menu. Dau Miu (豆苗; dòumiáo) is a Chinese vegetable that has become popular since the early 1990s, and now not only appears on English-language menus, usually as "pea shoots", but is often served by upscale non-Asian restaurants as well. Originally it was only available during a few months of the year, but it is now grown in greenhouses and is available year-round. Cashew chicken – Stir fried tender chicken pieces with cashews. Chow mein – literally means "stir-fried noodles". Chow mein consists of fried crispy noodles with bits of meat and vegetables. It can come with chicken, pork, shrimp or beef. Egg foo young – a Chinese-style omelet with vegetables and meat, usually served with a brown gravy. While some restaurants in North America deep-fry the omelet, versions found in Asia are more likely to fry in the wok. Egg roll – while spring rolls have a thin, light beige crispy skin that flakes apart, and is filled with mushrooms, bamboo, and other vegetables inside, the American-style egg roll has a thicker, chewier, dark brown bubbly skin stuffed with cabbage and usually bits of meat or seafood (such as pork or shrimp), but no egg. Fried rice – fried rice dishes are popular offerings in American Chinese food due to the speed and ease of preparation and their appeal to American tastes. Fried rice is generally prepared with rice cooled overnight, allowing restaurants to put leftover rice to good use (freshly cooked rice is actually less suitable for fried rice). The Chinese American version of this dish typically uses more soy sauce than the versions found in China. 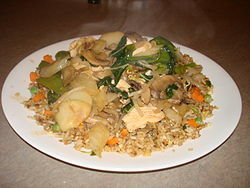 Fried rice is offered with different combinations of meat (pork, chicken and shrimp are the most popular) and vegetables. Ginger beef – (生薑牛肉; shēngjiāng niúròu) Tender beef cut in chunks, mixed with ginger and Chinese mixed vegetables. Ginger fried beef – (乾炒牛肉絲; gānchǎo niúròu-sī) Tender beef cut in strings, battered, deep dried, then re-fried in a wok mixed with a sweet sauce, a variation of a popular Northern Chinese dish. Kung Pao chicken – The Sichuan dish is spicy hot, but the versions served in North America tend to be less so if at all, and sometimes leave out the Sichuan pepper that is a fundamental part of the original dish. Lo mein ("stirred noodles"). These noodles are frequently made with eggs and flour, making them chewier than simply using water. Thick, spaghetti shaped noodles are pan fried with vegetables (mainly bok choy and Chinese cabbage (nappa)) and meat. Sometimes this dish is referred to as "chow mein" (which literally means "stir-fried noodles" in Cantonese). Moo shu pork – The original version uses more typically Chinese ingredients (including wood ear fungi and daylily buds) and thin flour pancakes while the American version uses vegetables more familiar to Americans, and thicker pancakes. This dish is quite popular in Chinese restaurants in the United States, but not so popular in China. Orange chicken – chopped, battered, fried chicken with a sweet orange flavored chili sauce that is thickened and glazed. The traditional version consists of stir-fried chicken in a light, slightly sweet soy sauce that is flavored with dried orange peels. Wonton soup – In most American Chinese restaurants, only wonton dumplings in broth are served, while versions found in China may come with noodles. In Canton, Wonton Soup can be a full meal in itself, consisting of thin egg noodles and several pork and prawn wontons in a pork or chicken soup broth or noodle broth. Especially in takeout restaurants, wonton are often made with thicker dough skins. Beijing beef – In China, this dish uses gai-lan (Chinese broccoli) rather than American broccoli. The New York metropolitan area is home to Chinese populations representing all 34 provincial-level administrative units of China, and hosts the largest, most diverse, and most prominent ethnic Chinese population outside of Asia; constituting the largest metropolitan Asian American group in the United States, and the largest Asian-national metropolitan diaspora in the Western Hemisphere. The Chinese American population of the New York City metropolitan area was an estimated 893,697 as of 2017; and given the New York metropolitan area's status as the leading gateway for Chinese immigrants to the United States, greater than San Francisco and Los Angeles combined, all popular styles of regional Chinese cuisine have commensurately become ubiquitously accessible in New York City, including Hakka, Taiwanese, Shanghainese, Hunanese, Szechuan, Cantonese, Fujianese, Xinjiang, Zhejiang, and Korean Chinese cuisine. Even the relatively obscure Dongbei style of cuisine indigenous to Northeast China is now available in Flushing, Queens, as well as Mongolian cuisine and Uyghur cuisine. The availability of the regional variations of Chinese cuisine originating from throughout the different provinces of China is most apparent in the city's Chinatowns in Queens, particularly the Flushing Chinatown (法拉盛華埠), but is also notable in the city's Chinatowns in Brooklyn and Manhattan. Kosher preparation of Chinese food is also widely available in New York City, given the metropolitan area's large Jewish and particularly Orthodox Jewish populations. The perception that American Jews eat at Chinese restaurants on Christmas Day is documented in media as a common stereotype with a basis in fact. The tradition may have arisen from the lack of other open restaurants on Christmas Day, as well as the close proximity of Jewish and Chinese immigrants to each other in New York City, and the absence of dairy foods combined with meat. Kosher Chinese food is usually prepared in New York City, as well as in other large cities with Orthodox Jewish neighborhoods, under strict rabbinical supervision as a prerequisite for Kosher certification. Chinese populations in Los Angeles represent at least 21 of the 34 provincial-level administrative units of China, making greater Los Angeles home to a diverse population of Chinese in the United States. Chinese American cuisine in the Greater Los Angeles area is concentrated in Chinese ethnoburbs rather than traditional Chinatowns. The oldest Chinese ethnoburb is Monterey Park, considered to be the nation's first suburban Chinatown. Although Chinatown in Los Angeles is still a significant commercial center for Chinese immigrants, the majority have relocated to the areas with significant Chinese immigrant populations is the San Gabriel Valley, stretching from Monterey Park into the cities of Alhambra, San Gabriel, Rosemead, San Marino, South Pasadena, Rowland Heights, Hacienda Heights, West Covina, Walnut, City of Industry, Diamond Bar, Arcadia, and Temple City. The Valley Boulevard corridor is the main artery of Chinese restaurants in the San Gabriel Valley. Another hub with a significant Chinese population is Irvine (Orange County). More than 525,000 Asian Americans live in the San Gabriel Valley alone, with over 67% of them being foreign born. The valley has become a brand-name tourist destination famous in China. Of the ten cities in the United States with the highest proportions of Chinese Americans, the top eight are located in the San Gabriel Valley, making it one the largest concentrated hubs for Chinese-Americans in North America. Some regional styles of Chinese cuisine include Beijing, Chengdu, Chonqing, Dalian, Hangzhou, Hong Kong, Hunan, Mongolian hot pot, Nanjing, Shanghai, Shanxi, Shenyang, Wuxi, Xinjiang, Yunnan, and Wuhan. Since the early 1990s, many American Chinese restaurants influenced by California cuisine have opened in the San Francisco Bay Area. The trademark dishes of American Chinese cuisine remain on the menu, but there is more emphasis on fresh vegetables, and the selection is vegetarian-friendly. This new cuisine has exotic ingredients like mangos and portobello mushrooms. Brown rice is often offered as an alternative to white rice. Some restaurants substitute grilled wheat flour tortillas for the rice pancakes in mu shu dishes. This occurs even in some restaurants that would not otherwise be identified as California Chinese, both the more Westernized places and the more authentic places. There is a Mexican bakery that sells some restaurants thinner tortillas made for use with mu shu. Mu shu purists do not always react positively to this trend. In addition, many restaurants serving more native-style Chinese cuisines exist, due to the high numbers and proportion of ethnic Chinese in the San Francisco Bay Area. Restaurants specializing in Cantonese, Sichuanese, Hunanese, Northern Chinese, Shanghainese, Taiwanese, and Hong Kong traditions are widely available, as are more specialized restaurants such as seafood restaurants, Hong Kong-style diners and cafes, also known as Cha chaan teng (茶餐廳; chácāntīng), dim sum teahouses, and hot pot restaurants. Many Chinatown areas also feature Chinese bakeries, boba milk tea shops, roasted meat, vegetarian cuisine, and specialized dessert shops. Chop suey is not widely available in San Francisco, and the area's chow mein is different from Midwestern chow mein. Chinese cuisine in Boston reflects a mélange of multiple influential factors. The growing Boston Chinatown accommodates Chinese-owned bus lines shuttling an increasing number of passengers to and from the numerous Chinatowns in New York City, and this has led to some commonalities in the local Chinese cuisine derived from Chinese food in New York. A large immigrant Fujianese immigrant population has made a home in Boston, leading to Fuzhou cuisine being readily available in Boston. An increasing Vietnamese population has also been exerting an influence on Chinese cuisine in Greater Boston. Finally, innovative dishes incorporating chow mein and chop suey as well as locally farmed produce and regionally procured seafood ingredients are found in Chinese as well as non-Chinese food in and around Boston. Joyce Chen introduced northern Chinese (Mandarin) and Shanghainese dishes to Boston in the 1950s, including Peking duck, moo shu pork, hot and sour soup, and potstickers, which she called "Peking Ravioli" or "Ravs". Her restaurants would be frequented by early workers on the ARPANET, John Kenneth Galbraith, James Beard, Julia Child, Henry Kissinger, Beverly Sills, and Danny Kaye. A former Harvard University president called her eating establishment "not merely a restaurant, but a cultural exchange center". The evolving American Chinese scene in Philadelphia exhibits commonalities with the Chinese cuisine scenes in both New York City and Boston. Similarly to Boston, Philadelphia is experiencing significant Chinese immigration from New York City, 95 miles to the north. There is a growing Fujianese community in Philadelphia as well, and Fuzhou cuisine is readily available in the Philadelphia Chinatown. Also like Boston, the emerging Vietnamese cuisine scene in Philadelphia is contributing to the milieu of Chinese cuisine. Hawaiian-Chinese food developed somewhat differently from Chinese cuisine in the continental United States. Owing to the diversity of Pacific ethnicities in Hawaii and the history of the Chinese influence in Hawaii, resident Chinese cuisine forms a component of the cuisine of Hawaii, which is a fusion of different culinary traditions. Some Chinese dishes are typically served as part of plate lunches in Hawaii. The names of foods are different as well, such as Manapua, from the Hawaiian contraction of "Mea ono pua'a" or "delicious pork item" from the dim sum bao, though the meat is not necessarily pork. Leeann Chin – Minnesota and North Dakota; owned at one time by General Mills Corp. 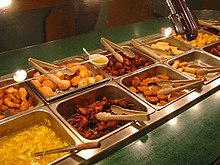 Many American films (for example:The Godfather; Ghostbusters; Crossing Delancey; Paid in Full[disambiguation needed]; Inside Out[disambiguation needed]) involve scenes where Chinese take-out food is eaten from oyster pails, a "consistent choice of cuisine in all these cases, however, might just be an indicator of its popularity". A running gag in Dallas is Cliff Barnes' fondness for inexpensive Chinese take-out food, as opposed to nemesis J. R. Ewing frequenting fine restaurants. Among the numerous American television series and films that feature Chinese restaurants as a setting include Seinfeld (particularly the episode The Chinese Restaurant), Year of the Dragon, Lethal Weapon 4, Mickey Blue Eyes, Rush Hour 2, and Men in Black 3. In most cases it is not an actual restaurant but a movie set that typifies the stereotypical American Chinese eatery, featuring "paper lanterns and intricate woodwork", with "numerous fish tanks and detailed [red] wallpaper [with gold designs]" and "golden dragons", plus "hanging ducks in the window". ^ a b Wu, David Y. H.; Cheung, Sidney C. H. (2002). The Globalization of Chinese Food. Great Britain: Curzon Press. p. 57. ISBN 978-0-8248-2582-9. ^ Ch Six, "The Globalization of Chinese Food: The Early Stages", in J. A. G. Roberts. China to Chinatown: Chinese Food in the West (London: Reaktion, 2002) ISBN 1-86189-133-4. ^ Liu, Yinghua; Jang, SooCheong (Shawn) (2009-09-01). "Perceptions of Chinese restaurants in the U.S.: What affects customer satisfaction and behavioral intentions?". International Journal of Hospitality Management. 28 (3): 338–348. doi:10.1016/j.ijhm.2008.10.008. ^ Smith, Andrew F. (1 October 2009). Eating history: 30 turning points in the making of American cuisine. Columbia University Press. p. 47. ISBN 978-0-231-14092-8. Retrieved 22 June 2011. ^ Godoy, Maria (23 February 2016). "Lo Mein Loophole: How U.S. Immigration Law Fueled A Chinese Restaurant Boom". NPR. Retrieved 23 February 2016. ^ Passy, Charles (2015-08-26). "Meet the Pilot Who Doubles as Block Island's Chinese-Food Delivery Guy". The Wall Street Journal. pp. A1. Retrieved 26 August 2015. ^ Andrew Coe Chop Suey: A Cultural History of Chinese Food in the United States (New York: Oxford University Press, 2009). ^ a b Hayford (2011), p. 11-12. ^ "China to Chinatown". University of Chicago Press. Retrieved 2015-12-10. ^ "Chinese Immigrants Chase Opportunity in America". NPR Morning Edition. November 19, 2007. Retrieved 2011-07-09. ^ "20 Secrets of Your Local Chinese Takeout Joint". The Daily Meal. Retrieved September 24, 2017. ^ "Sweet & Sour: A Look at the History of Chinese Food in the United States". Smithsonian Asian Pacific American Center. Smithsonian National Museum of American History. Archived from the original on April 14, 2013. Retrieved March 20, 2013. ^ Solomon, Charmaine (April 15, 2006). The Complete Asian Cookbook. p. 281. ISBN 9780804837576. ^ Parkinson, Rhonda. "Regional Chinese Cuisine". About.com. Archived from the original on 2007-02-17. Retrieved July 8, 2014. ^ a b c Andrew F. Smith (2007). The Oxford Companion to American Food and Drink. Oxford University Press. pp. 119–122. ISBN 9780199885763. Retrieved 1 April 2016. ^ "Chef Ming Tsai wants you to have a Chinese friend". CNN. January 19, 2011. Retrieved on January 19, 2011. ^ 5:46 pm (2009-02-20). "Anthony Bourdain Plays It Safe at Hop Kee, Shuns 'Phantom Menu' - Grub Street New York". Newyork.grubstreet.com. Retrieved 2018-04-16. ^ Jung (2010), p. 197 etc..
^ "Solving a Riddle Wrapped in a Mystery Inside a Cookie". The New York Times. January 16, 2008. ^ New University. "History and Culture: Chinese Food". New University. Retrieved 2018-04-16. ^ "Beef and Broccoli | Can You Stay For Dinner?". Canyoustayfordinner.com. Retrieved 2018-04-16. ^ Vivian Yee (February 22, 2015). "Indictment of New York Officer Divides Chinese-Americans". The New York Times. Retrieved February 23, 2015. ^ "Chinese New Year 2012 in Flushing". QueensBuzz.com. January 25, 2012. Retrieved February 23, 2015. ^ "SELECTED POPULATION PROFILE IN THE UNITED STATES 2017 American Community Survey 1-Year Estimates New York-Newark, NY-NJ-CT-PA CSA Chinese alone". United States Census Bureau. Retrieved January 27, 2019. ^ "Persons Obtaining Lawful Permanent Resident Status by Leading Core Based Statistical Areas (CBSAs) of Residence and Region and Country of Birth: Fiscal Year 2013". Yearbook of Immigration Statistics: 2013. Department of Homeland Security. 2013. Retrieved January 3, 2015. ^ Julia Moskin. "Let the Meals Begin: Finding Beijing in Flushing". The New York Times. Retrieved November 26, 2017. ^ Moskin, Julia (2010-02-09). "Northeast China Branches Out in Flushing". The New York Times. Retrieved 2011-05-09. ^ Max Falkowitz (August 25, 2018). "A World of Food, Outside the U.S. Open Gates". The New York Times. Retrieved August 25, 2018. ^ "Why Do American Jews Eat Chinese Food on Christmas? — The Atlantic". Theatlantic.com. 2014-12-23. Retrieved 2018-04-16. ^ "'Tis the season: Why do Jews eat Chinese food on Christmas? - Jewish World Features - Israel News". Haaretz. 2014-12-24. Retrieved 2018-04-16. ^ "Movies and Chinese Food: The Jewish Christmas Tradition | Isaac Zablocki". Huffingtonpost.com. 2017-12-06. Retrieved 2018-04-16. ^ "Mu Shu Tortilla Flats: Chinese restaurant needs better mu shu wraps". AsianWeek. February 27, 2004. Archived from the original on October 7, 2007. Everything was well and good with one huge exception: The mu shu wrappers were flour tortillas! ^ Mennies, Leah. "The Story of Peking Ravioli". Lucky Peach. Archived from the original on March 17, 2015. ^ Hafner, K., & Lyon, M. (1996). Where wizards stay up late: The origins of the Internet. New York: Simon and Schuster, p. 112. ^ "Joyce Chen, 76, U.S. Popularizer Of Mandarin Cuisine". New York Times. Associated Press. August 26, 1994. Retrieved April 12, 2019. ^ Robertson, Rain. "Joyce Chen". Culinary Cambridge. Cambridge Historical Society. Archived from the original on April 10, 2015. Retrieved 12 June 2013. ^ Matt Katz (July 20, 2018). "Leaving New York to Find the American Dream in Philadelphia". The New York Times. Retrieved April 18, 2019. ^ "How a Chinese restaurant in America's Midwest won Sean Connery's heart". Public Radio International. Retrieved 2017-06-05. ^ a b "Why Everyone Films At The Same Damn New York Chinese Restaurant - Scouting NY". www.scoutingny.com. ^ a b "10 Binge-Worthy Movies to Watch With Chinese Take-Out". Chen, Yong (2014). Chop Suey, USA: The Story of Chinese Food in America. New York: Columbia University Press. ISBN 9780231168922. Coe, Andrew (2009). Chop Suey: A Cultural History of Chinese Food in the United States. New York: Oxford University Press. ISBN 9780195331073. Jung, John (2010). Sweet and Sour: Life in Chinese Family Restaurants. Cypress, CA: Yin and Yang Press. ISBN 9780615345451. Lee, Jennifer 8. (2008). The Fortune Cookie Chronicles: Adventures in the World of Chinese Food. New York: Twelve. ISBN 9780446580076. Roberts, J. A. G. (2002). China to Chinatown: Chinese Food in the West. London: Reaktion. ISBN 1861891334. Wu, David Y. H.; Cheung, Sidney C. H. (2002). The Globalization of Chinese Food. Richmond, Surrey: Curzon. ISBN 0700714030. Sara Bosse, Onoto Watanna, with an Introduction by Jacqueline M. Newman. Chinese-Japanese Cook Book. (1914; reprinted, Bedford, MA: Applewood Books, 2006). ISBN 1-55709-371-7. ISBN 978-1-55709-371-4. Hom, Ken (1997). Easy Family Recipes from a Chinese American Childhood. New York: Knopf. ISBN 0-394-58758-8. Eileen Yin-Fei Lo and Alexandra Grablewski. The Chinese Kitchen: Recipes, Techniques and Ingredients, History, and Memories from America's Leading Authority on Chinese Cooking. (New York: William Morrow, 1999). ISBN 0-688-15826-9. 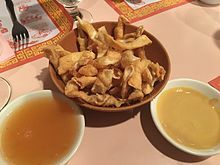 Wikimedia Commons has media related to American Chinese cuisine. Imogen Lim Restaurant Menu Collection: American menus. Vancouver Island University Library.